Located just 20 minutes from Seville, the capital of Andalusia and the center of the region, Legado Oromana Hotel has an exceptional location in the natural setting of the Pine forest of Oromana, standing as a reference for relaxation and nature and eco tourism. Just a few minutes from the industrial area in Alcalá de Guadaira. 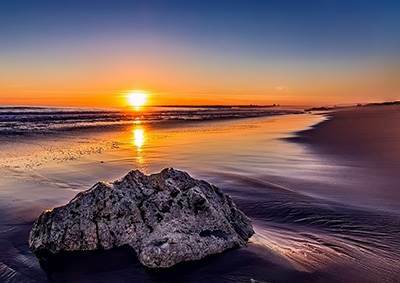 Maximum comfort, relaxed atmosphere and the best value for money for a dream stay that meets the expectations of our guests, whether your travel is for professional, personal or family reasons. 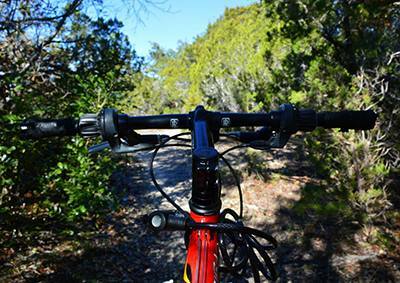 You can do outdoor sports, using the network of rural roads that go by at the river surroundings or at San Juan open air pavilion. 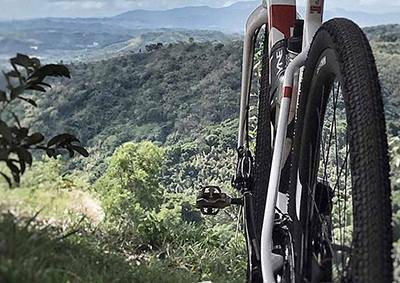 From the Legado Oromana Hotel, our clients start the morning practicing running, cycling, trekking … Routes up to 55 kms. 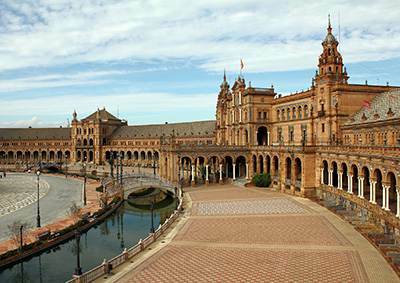 along the Guadaíra River, the Pines forest, the Oromana Park and along paths through the Vega de Alcalá and its farms. Choose the difficulty and the time you want to run and enjoy these unique landscapes, return to your room for a good shower and now you´re ready to have a perfect day! 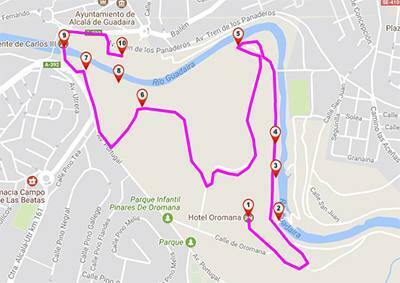 We propose you these routes previously done by our guests. 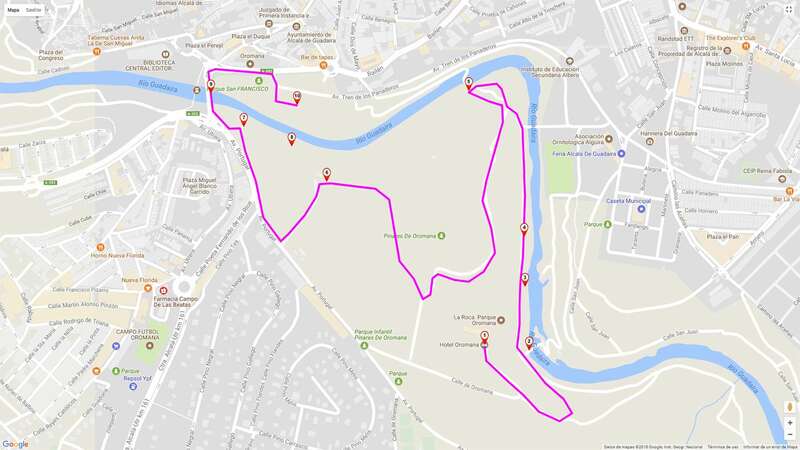 Remember that you must inform yourself about the difficulty of each one before starting and please ask at the reception for the expected weather for the day of your route. The starting point will be the Legado Oromana Hotel. From here, we will head toward the children’s playground. Next to it we will find the road of get down to the river, where we will take the first entrance to the right, going downstairs. Our first stop will be the Benarosa Mill that is in the right bank of the river. Further on and at the same side there is the San Juan Mill. Going back to the left bank we will get to the Oromana Mill that is close to a natural fountain, at present turned into viewpoint. Keeping straight ahead by the left bank of the river and leaving behind the footbridge we get to the Algarrobo Mill, from which we see, right opposite of us, the remains of the La Caja Mill. The road bifurcates, one path goes up and the other one goes straight ahead. 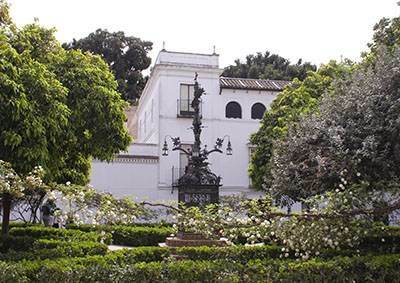 If we go up, we arrive to the San Roque Hermitage. We go back on our track and continue ahead on getting to La Tapada Mill coming into the zone known as El Bosque (The Forest). 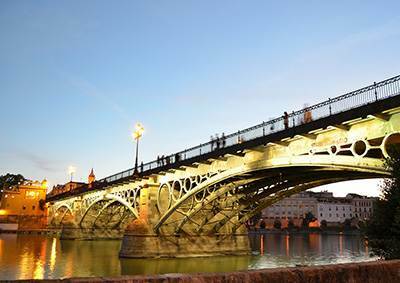 If we keep ahead we will get to [King] Carlos III Bridge. If we go across it and turn to the right we find the San Francisco Park, where we can enjoy in a leisure place the well-deserved rest after having finished our route. 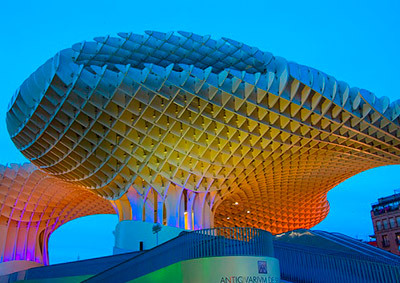 Isla Mágica is a theme park located in Seville, based in the discovery of America and opened in 1997. It was built over some facilities of the Universal Exhibition of 1992. The park has 6 themed areas and an aquatic one named Aqua Magica. At the time of its opening, it was the first theme park located inside a city around the world, they are usually located away from the urban centers. 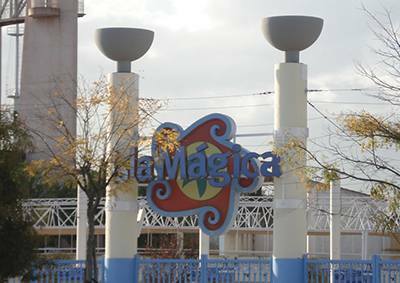 The Aqua Magica area, inaugurated in 2014, contains an artificial beach, waves pool, slides, family and children’s swimming pools, children’s slides and a slow river. In 2017 a swimming pool with zip lines was added, also a kids area and a relax area too. Alcalá is situated on an elevated area named Los Alcores. This area includes the towns of Carmona, El Viso del Alcor, Mairena del Alcor and Alcalá de Guadaíra. The Alcores are a tertiary formation with a triangular structure that runs from the northeast to the southwest, between the towns of Carmona and Alcalá de Guadaira, reaching in Carmona its maximum elevation (257 meters) and the smaller width (2 km). The natural vegetation of Los Alcores, oaks, wild olives and bushes, has been replaced by citrus, olive trees and intensive labor crops, and also by grasslands for the feeding of the cattle. The different geological layers that compose Los Alcores are an important source of raw materials. At the base of this formation there are blue and gray marls that have been used traditionally for the manufacture of adobes and in pottery. 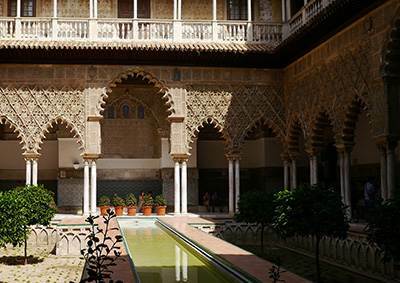 Located in the south of Seville. Morón de la Frontera is the eleventh municipality of the province by its population and the seventh largest one. Bordered on the north by Marchena and Arahal, on the east by La Puebla de Cazalla, on the west by Arahal and on the south by Montellano, Coripe and Pruna as well as with Cádiz . 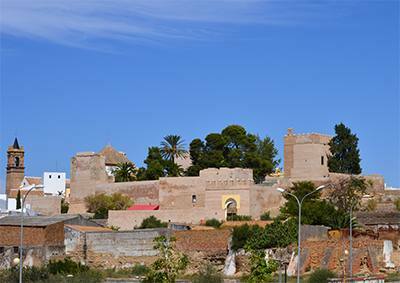 The origins of the city go back to prehistory, with the development of the first human settlements around the mountain where today you can find a 13th century castle. The historic center stands for narrow, winding and steep streets, while the new neighborhoods are plain located to the west and northwest of the city. 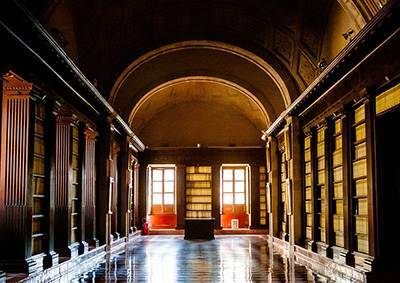 Part of the architectural heritage of Morón de la Frontera is declared of cultural interest, with the category of historical-artistic. 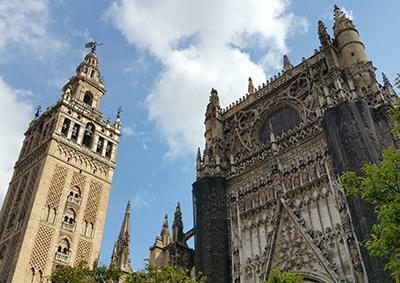 It has a great cathedral that was built triying to copy the cathedral of Seville. 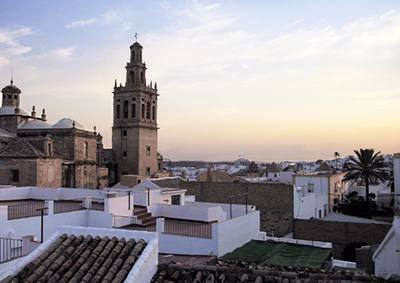 The economic activity of Morón is based on the sectors of construction, olive oil, cereals, vegetable preserves, the extraction of calcium oxide and tourism. 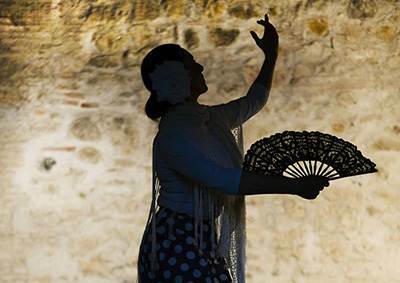 UNESCO has declared the “Cal de Moron” (extraction of calcium oxide) Intangible Cultural Heritage of Humanity.